Encik Hamidon bin Abdullah is the Executive Chairman and major shareholder of the Company. He was appointed to the Board of EPMB on 20 January 1997. 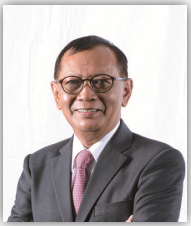 Encik Hamidon is the founder of EPMB Group and has been the driving force in developing the Group as one of the Tier-1 automotive component vendor in Malaysia. Encik Hamidon obtained his Bachelor's Degree in Applied Mathematics & Computer Science in 1974 and a Master's Degree in Urban Planning in 1975 from the University of Adelaide, Australia. Upon graduation in 1975, he started his career as a System Analyst with the South Australia Highway Department. After 4 years, he was engaged as an Urban Planning Consultant with P.G. PakPoys & Associates (KL). In 1983, he joined an architect firm, Hijjas Kasturi & Associates. He is also the Executive Chairman of Nadayu Properties Berhad. His spouse, Dr Linden Hamidon and two sons, Johan bin Hamidon and Aidan Hamidon, are also Directors and shareholder of the Company.